36 Holes of the Greatest Mini-Golf Adventure in Branson. Save by Playing All 36 Holes! 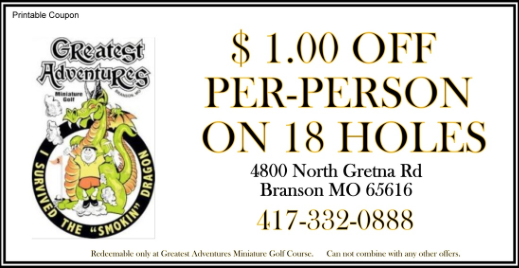 Play both Greatest Adventures Mini-Golf Courses & Save! Eat & Play! Try our 5 Star rated Grill. We have Group Rates – Churches, Schools and Non-Profits please call for Special Group Rates and schedule your next Group outing! © 2019 Greatest Adventures Mini Golf. | All Rights Reserved | Developed by Wego Creative LLC.